Is Roper Industries, Inc. (NYSE:ROP) worth your attention right now? Hedge funds are becoming less hopeful. The number of long hedge fund bets were trimmed by 3 recently. Our calculations also showed that ROP isn’t among the 30 most popular stocks among hedge funds. ROP was in 29 hedge funds’ portfolios at the end of the fourth quarter of 2018. 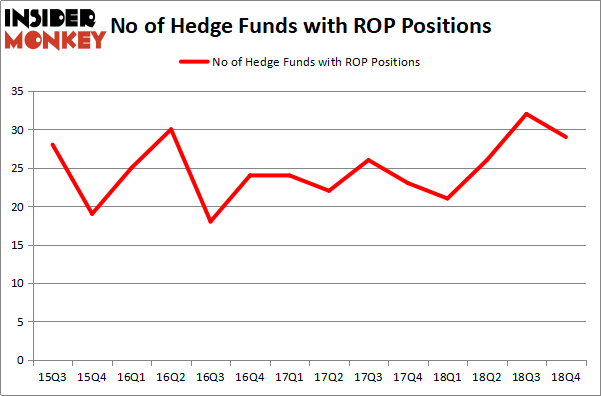 There were 32 hedge funds in our database with ROP positions at the end of the previous quarter. We’re going to take a gander at the key hedge fund action regarding Roper Industries, Inc. (NYSE:ROP). What have hedge funds been doing with Roper Industries, Inc. (NYSE:ROP)? 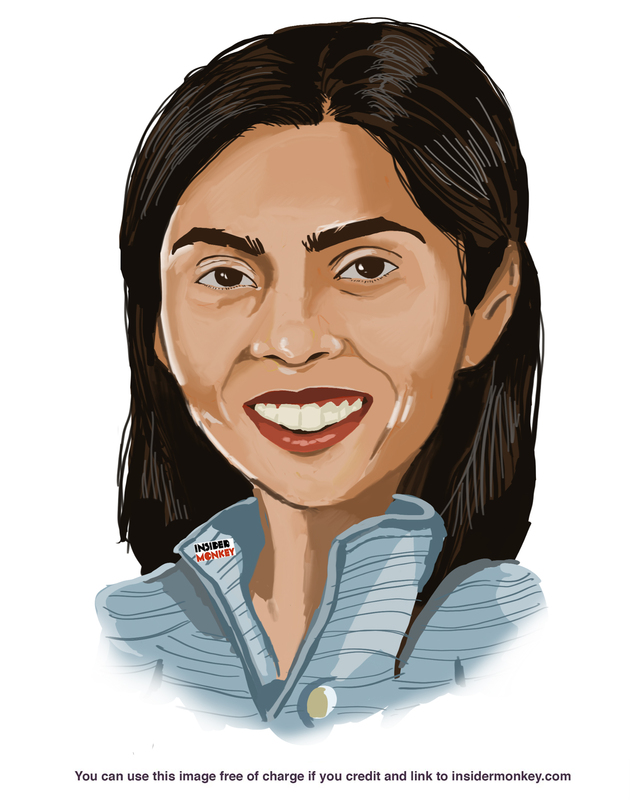 Heading into the first quarter of 2019, a total of 29 of the hedge funds tracked by Insider Monkey were bullish on this stock, a change of -9% from one quarter earlier. By comparison, 21 hedge funds held shares or bullish call options in ROP a year ago. With hedgies’ positions undergoing their usual ebb and flow, there exists a few noteworthy hedge fund managers who were increasing their stakes considerably (or already accumulated large positions). The largest stake in Roper Industries, Inc. (NYSE:ROP) was held by Akre Capital Management, which reported holding $417.7 million worth of stock at the end of September. It was followed by Waratah Capital Advisors with a $54.1 million position. Other investors bullish on the company included Citadel Investment Group, Renaissance Technologies, and Winton Capital Management. Judging by the fact that Roper Industries, Inc. (NYSE:ROP) has experienced falling interest from hedge fund managers, it’s easy to see that there is a sect of funds that slashed their entire stakes in the third quarter. Intriguingly, Alexander Mitchell’s Scopus Asset Management sold off the largest stake of the 700 funds monitored by Insider Monkey, totaling close to $27.7 million in stock. Malcolm Fairbairn’s fund, Ascend Capital, also cut its stock, about $25.1 million worth. These moves are important to note, as aggregate hedge fund interest dropped by 3 funds in the third quarter. Let’s also examine hedge fund activity in other stocks – not necessarily in the same industry as Roper Industries, Inc. (NYSE:ROP) but similarly valued. These stocks are TD Ameritrade Holding Corp. (NASDAQ:AMTD), Johnson Controls International plc (NYSE:JCI), Monster Beverage Corp (NASDAQ:MNST), and eBay Inc (NASDAQ:EBAY). This group of stocks’ market caps are closest to ROP’s market cap. As you can see these stocks had an average of 29.25 hedge funds with bullish positions and the average amount invested in these stocks was $1155 million. That figure was $647 million in ROP’s case. eBay Inc (NASDAQ:EBAY) is the most popular stock in this table. On the other hand TD Ameritrade Holding Corp. (NASDAQ:AMTD) is the least popular one with only 17 bullish hedge fund positions. Roper Industries, Inc. (NYSE:ROP) is not the least popular stock in this group but hedge fund interest is still below average (though it is close to its all time high). Our calculations showed that top 15 most popular stocks among hedge funds returned 19.7% through March 15th and outperformed the S&P 500 ETF (SPY) by 6.6 percentage points. Hedge funds were also right about betting on ROP as the stock returned 22.6% and outperformed the market as well. Were Hedge Funds Right About Flocking Into Sempra Energy (SRE)? Is IQVIA Holdings, Inc. (IQV) A Good Stock To Buy? Here is What Hedge Funds Think About AutoZone Inc. (AZO) Hedge Funds Dropped The Ball On Fortive Corporation (FTV) Here is What Hedge Funds Think About BT Group plc (BT) Were Hedge Funds Right About Souring On Canon Inc. (NYSE:CAJ)?